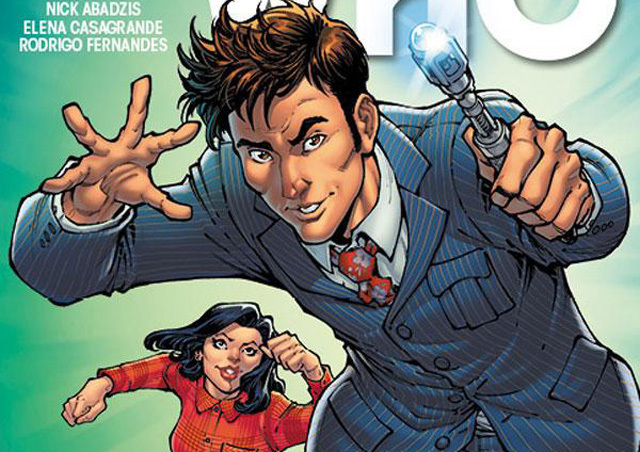 Titan Comics: Doctor Who - THE TENTH DOCTOR #2.7 Review | Warped Factor - Words in the Key of Geek. Tony’s less scared than he should be. I’m going to come clean. 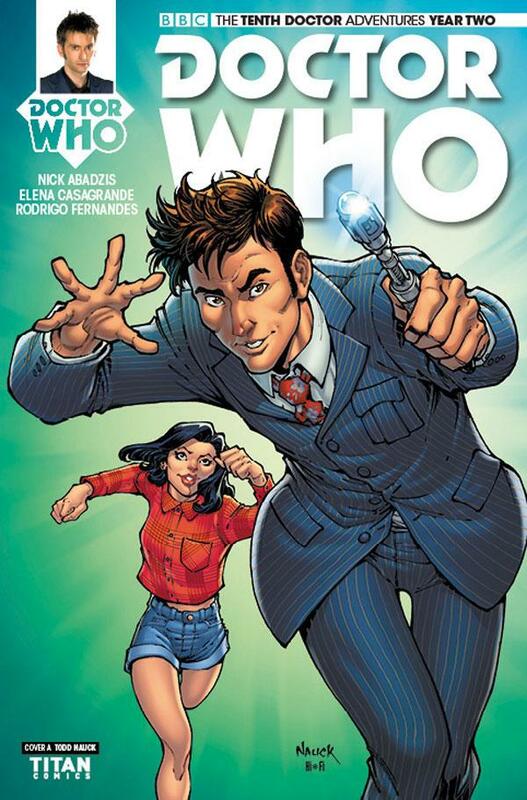 I haven’t been enjoying the storyline of Nick Abadzis’ latest Tenth Doctor adventure since it turned itself from a Cave Bear-style Neanderthal lifestory into an ‘alien gladiator’ story. There have been treats along the way, certainly – the retrieval of a few characters from the Tenth Doctor’s previous comic-book adventures, the return of an on-screen favourite and so on – but essentially the story of Mr Ebonite and his controlled-terrain arena in which people from across time and space have their memories wiped and fight for survival as a kind of reality TV game-show for the masses of a higher culture, while simultaneously providing life-energy snacks for the vampiric Ebonite has been all rather oddly delivered for my money – the interesting elements rather muted and supressed in favour of a continual battle by the Doctor and his friends to keep control of their minds and memories and so resist the thrall of the game’s set-up. This episode likewise has a kind of predictability to it that means the issue falls into the ‘also-ran’ category – Doctor’s companion under the thrall of Ebonite, does a bit of strutting about, showing off new powers, the Doctor breaks the thrall, they make a good choice, help to defeat the bad guy, home in time for tea. Essentially, it’s Enlightenment with the Tenth Doctor, a bit of miniscope action, a character who just won’t stay dead and the acceptance of an additional companion on board the Tardis, meaning some friends can finally share the experience of time and space fully. There’s nothing, as such, wrong with any of that, and far be it from me to criticise Abadzis’ storytelling skills – he’s more than proved his worth in the last couple of years of Doctor Who at Titan Comics. It’s just hard to escape the sensation of having seen the themes and action of this storyline already done, and done better, and having had our expectations raised by some of the great comic-book stories in the Tenth Doctor’s back catalogue. That said, and even with the story taking turns in this issue that feel a bit like filler on the way to a happy ending, let’s take a moment out to thank Elena Casagrande and Rodrigo Fernandes on art and colourwork duties. Why? Because they render a world that’s believable here in all its aspects – the watercolour tones of the Neanderthal landscape, the darkness of Ebonite and the fundamental ordinariness of where the story ends, all feel very real, even if the people themselves are sometimes a little notional in their rendering. Casagrande in particular makes this final-feeling issue in the storyline come alive, with some clever panel-splitting to allow for, for example, the gradual change of a person’s mind to be relayed through four mini-panels, and on one fairly glorious page to combine an action sequence in the main body of the panel, and no fewer than twelve ‘simultaneous’ reaction shots, joined together like a collar. Try and do that in an on-screen story and you’d make the viewer sick, but in a comic-book with a large cast, it’s called for, and Casagrande delivers in a way that allows the reader to take it all in while moving through the page with a logical flow. That’s a very intelligent approach to storytelling through art, and it serves the issue well. One to buy, then? Wellll it’s difficult for me to wholeheartedly recommend it because of that sense of familiarity and relative anti-climax in the scenario itself. On the other hand it does seem to cap a story that brings together a lot of the Tenth Doctor’s previous acquaintances, give new life to a particular fan favourite undercover organisation, and set the seal on a new Tardis team, one that could have unique strengths and face unique challenges – it’s difficult to think of a Tardis team where the two human travellers were pre-existing best friends with no (known) romantic connection, but that’s the territory we’ll be in when the Tenth Doctor’s next adventure kicks off. So pick this one up because you’re a fan, which is to say a semi-insane completist, or if you’ve been especially enjoying the Arena of Fear storyline. If nothing else, Abadzis brings the story to a satisfactory end on many levels, while forming bonds that could re-appear down the line with interesting new effects, and Casagrande delivers a visual style that flows beautifully and makes the most of Ebonite’s nature to deliver a shudder and a chill or two before the end of the issue (Perhaps weirdly, he’s a villain who becomes significantly more scary the smaller he becomes). The new Tardis team promises much, so pick this one up to see how one half of it is redeemed, and the other half accepts the challenge of all of time and space. And then before you know it, it’ll be time to look forward to their next adventure.